Are you new in Sweden and want to start your own business? 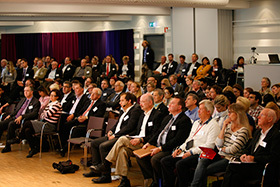 What are the necessary requisites for starting up a business as a newcomer in Sweden? The Swedish Agency for Economic and Regional Growth (Tillväxtverket) is presenting a lecture about the regulation and the different processes and steps that you need to take if you are thinking of starting your own business. This lecture will also be joined by ”The Swedish Compass for Companies” (IFS) and ”Företagsaccelerator för nyanlända entreprenörer i Stockholm” (Almi), who will present how they are helping Swedish unemployed newcomers to set up a business in Sweden. You will also meet newcomers who have started their own companies. Aktiviteten arrangeras av Tillväxtverket, IFS, Almi Företagspartner.